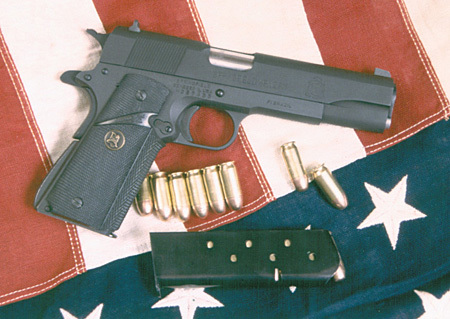 The Springfield Mil-Spec 1911A1 is pictured below. The gun, magazine and ammunition are laying on a United States of America flag. The Springfield Mil-Spec 1911A1 is a parkerized gun that is not truly mil-spec, but close enough for most folks who don’t know better. The Springfield Mil-Spec 1911A1, for example, does not have a mil-spec front sight. The grips are also aftermarket pieces.